This Article questions the widely-held view, expressed most clearly by John Hart Ely's War and Responsibility, that Congress must provide ex ante approval for all uses of force. It critiques Ely's approach, both his method of constitutional interpretation and his substantive goals for the war-making process. It proposes a different vision for war powers that provides more flexibility to the political branches. It then argues that a Congress-first process does not produce its desired substantive outcomes, and questions whether the costs and benefits of different war-making processes are sufficiently clear to cement one into place as a matter of constitutional law. Finally, it discusses the transformation of warfare and threats to American national security that have arisen since the development of the Congress-first argument. International terrorism of the September 11, 2001 type, rogue nations, and the proliferation of weapons of mass destruction (WMD), place new demands on the Constitution's system for making war. 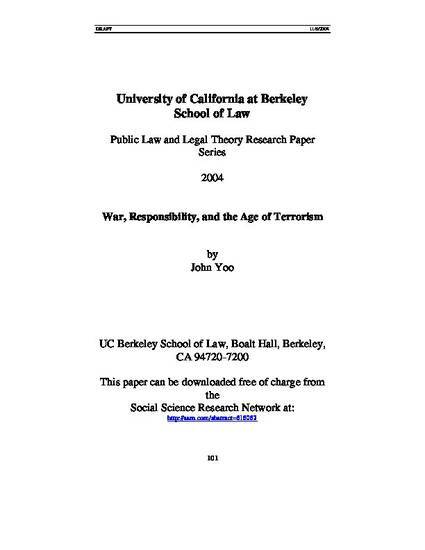 This Article counsels against establishing a fixed constitutional process for war powers when the struggle against al Qaeda is still early and the costs and benefits of different approaches cannot yet be measured with any confidence.